If you are conducting a comprehensive social media audit, you will want to segment the audit into two key audit processes: a Brand Presence Audit and a Content Evaluation Audit. A Brand Presence Audit is the process of discovering the actual pages and accounts that either represent or associate with your brand(s), and then reviewing these points-of-presence (POPs) with the criteria you set. A main goal of this audit process is to be able to "clean-up" the web for any POPs you find that should be shut down (due to being a stale account or an infringement on your brand). That is one sheet of your Presence Audit. Another sheet of the Presence Audit should have all of the elements that are listed in the profile data, the meta data of the account that states posting frequency and audience size, and then security data associated with each POP (such as the tools attached to the POP). For more details on preparing for your audit and developing your review criteria, read our Social Media Governance Plan: Part 3. You should first have an accurate Brand Presence Audit before conducting a Content Evaluation Audit (the review process of what is being said in the content stream of the brand presence). Here are the top five areas where we see a lot of errors and omissions in corporate Brand Presence Audits and social media audit reports. An important security measure is to know what apps and SaaS tools are attached to the POP. Most people remember to track the centralized password tools (since tracking the POP password is critical), but many people forget to list the publishing tools and other apps that are attached to the POP. Security breaches can happen at any point (included via an attached tool), so knowing the tool chain is an important social media governance practice and should be included in your presence audit. For more information about securing your tool chain, check out our white paper 7 Critical Steps to Tame Your Brand Presence. Every page and account was first created with a unique identifier number, usually followed by an employee claiming the appropriate brand "vanity URL". But many networks create other URLs for your pages and you need to be aware of these addresses, as someone might be using them (for example, as a referenced website on another POP). We wrote a post on this issue so be sure to review What's Another URL Among Friends, Facebook? Make sure you track all addresses for each POP. Many people think these Place pages for your business locations don't matter, much. But they do! We've uncovered many Place pages for our customers where their customers and employees are posting. In several cases, we have presented Place pages where disgruntled customers have posted, where lewd language has sat for months, and even where a customer complained of a serious (allergy) reaction to a product. All of these were unmonitored Place pages and the comments received no support or commentary from the company. It may even be a higher corporate risk if you have unauthorized employees trying to comment and help people (if they are not trained). If you have local retail outlets, these Place pages are even more critical to your business. For every company, it is important to have a strategy for managing these Place pages, whether you choose to monitor them as stand-alone Place pages or whether you choose to bring them under your own business pages via Facebook Business Manager or via Google My Business location upload. If you are a global company, you will want to have a strategy that works for your global teams and locations. Many companies rely on their social media policy to do the majority of heavy lifting regarding their employees social media sites. If you are not in a regulated industry, and you do not have formal employee social success or ambassador programs, then this strategy works for most companies. Unmonitored employees in this case are a lower risk to the company. But what about partners who associate strongly with your brand? Many companies have an "official" partner program and these partners have the right to use your brand name(s) and even logos. It is common that other vendors (who are not official partners) state that they are indeed partners and fool customers by stating this association in their social media. This is a real risk to your corporation and the level of concern should be dependent on the importance of you channel partners to your business. I'm sure that great care is taken in vetting partners, and customers deserve to work with those companies (and not the fakers). For Regulated companies, monitoring employees and partners is a requirement. Most regulated companies have this covered, to varying degrees, but many companies forget about monitoring ex-employees! It is also a requirement that regulated companies ensure that ex employees remove all association with their company, and ensure that customers are not falsely misled. Another third-party monitoring omission that we commonly see is also within the regulated industries; many companies are monitoring their employees social accounts for the major social networks, but they completely leave out the vertical industry networks and the micro-pages on these industry sites. A good example of this is ensuring that mortgage companies track their employees (their loan officers) pages on Zillow, Houzz, and Trulia (as well as their Facebook, Twitter and Linked In). Every industry has vertical market publications, websites, and social networks and it is important to include these in your social media governance process and your brand presence audit. Many people either forget to add a referenced website to their social media POPs or they forget to confirm that the referenced link is actually still working. For most companies, using social media to help drive leads and customers to their website is a listed objective of the brand presence. To accomplish this objective, the correct link needs to be available. We also commonly see broken links on a social POP, usually because the referenced website URL no longer points to the correct website link. Testing the URL and confirming any website page changes with the web team is an important step. Is this a major risk to your corporation? Perhaps it's a slight ding to your brand reputation for having a broken link, but it is not a significant corporate risk. But why squander the opportunity to drive customers to receive more information about your company and products? 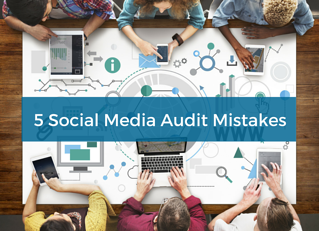 Those are the top five areas where we see a lot of mistakes on corporate social media audits. If you are familiar with Brandle, then you are already aware that we help companies automatically Discover, Inventory, and Monitor their web presence. One of the key benefits of Brandle is not only the automatic audit features, but the fact that you have a living Inventory at your fingertips that never goes out of date (unlike a manual audit that is out of date the moment it is completed). If you are new to Brandle, please review our Products page to see highlights of the Brandle Presence Manager. Or click the button below to contact us for a demo. We are confident that we can help you with your social media governance program.